Mana Interior deals in imported false ceiling, plaster of paris ceilings, window blinds, wall paper and building paint services. 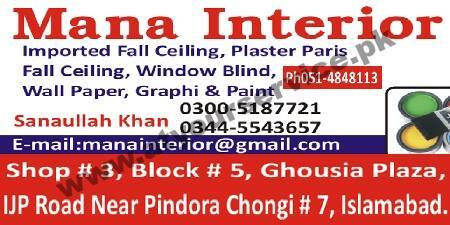 Mana Interior is located in Ghousia Plaza, IJP Road, Islamabad. It deals in imported false ceiling, plaster of paris ceilings, window blinds, wall paper and building paint services.